Nick attended law school at the University of Denver, Sturm College of Law and graduated in the top 5% of the 2014 class. While in law school he was the Managing Editor of the Transportation Law Journal and obtained dual certificates in Constitutional Rights & Remedies and Workplace Law. In his third year, Nick was awarded the Charles F. Brannan Scholarship, the Arthur B. Hayutin Scholarship for excellence in constitutional law, and received the John Phillip Linn Labor Law Award. Prior to joining the firm as a law clerk, Nick was a summer intern for Judge Berryhill in the First Judicial District and interned with the Jefferson County Attorney’s Office. Throughout law school Nick excelled in courses related to civil rights law, achieving Scholastic Excellence Awards for the highest exam grade in Constitutional Law, Criminal Procedure, Remedies, and Administrative Law. 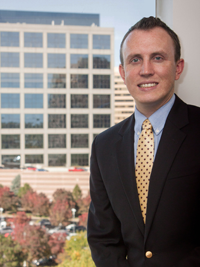 Nick’s practice focuses on representing governmental entities in a wide range of litigation matters, including civil rights lawsuits, employment-related claims, and land use disputes. He also assists in insurance defense litigation and premises liability claims. Nick received his bachelor’s degree in History and German from the University of Colorado at Boulder. Prior to attending law school, Nick obtained his sommelier’s license and worked for a four-star restaurant in downtown Boulder. When not in the office, he enjoys traveling and donates frequently at Bonfils Blood Center.